A Chippewa Chief showed me this catch at the St. Louis Exposition. Dr. Furness saw it done by the Uap boy who taught him "Carrying Money." Two persons (A and B) and one loop of string are required for this figure. 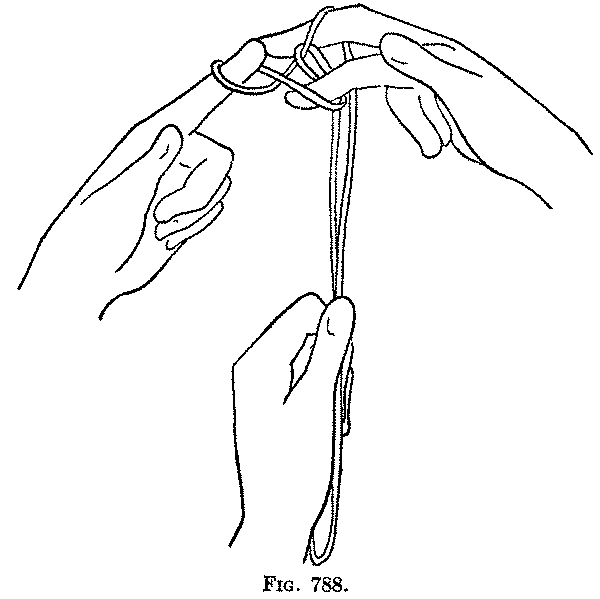 First: "B" puts the loop around "A's" index finger and holds it, about twelve inches from "A's" finger, with his left thumb and index, being careful to keep the two strings uncrossed and parallel (Fig. 785). Second: "B" then passes his right hand palm down to the left of the strings (about six inches from "A's" finger) and, catching with the right middle finger the left hand string, draws it to the right past the right hand string (Fig. 786), and then puts the middle finger down between the two strings. 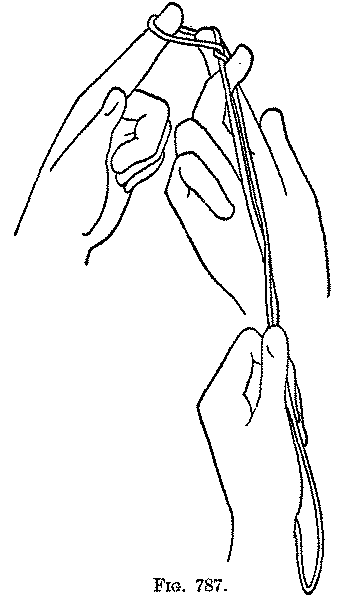 Then turning the hand with the palm up, he puts his index finger from below between the strings close to "A's" finger, where they are uncrossed (Fig. 787). Now turning the palm down again, he places the tip of his middle finger on the tip of "A's" index (Fig. 788) and removes his index finger from the loop around it. Third: If "B" now pulls the strings he has been holding with his left hand, the strings will come off "A's" index and "B's" middle finger held tip to tip.